mr. mumbi a great leader to join apart with a vision. in the name of tribalism pipo have been cheated by PF that UPND is a tribal part but is this true? no its not. lets open our eyes and see the happenings in PF Govt. no focus. 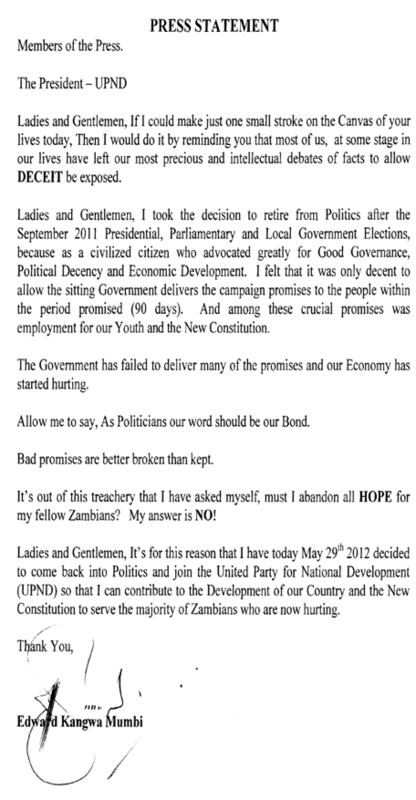 lets support the oppotion UPND with a new revolution. as we are much aware that MMD is dead now. mumbi u are a man of intgrity. good luck and VIVA UPND VIVA HH.